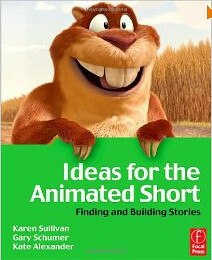 Ideas for the Animated Short: Finding and Building Stories by Karen Sullivan, Gary Schumer and Kate Alexander is a book I was looking forward to reading but had my expectations take a beating right from chapter one. From then on it became a chore to read. Despite that, I persevered and breathed a big sigh of relief when I finally reached the last page. Which was disappointing because I took a long time in choosing what animation book to buy on Amazon as part of a two book purchase that included The Animator's Survival Kit by Richard Williams (a book that is considered an essential in any animator's library). What I was looking for was a lively book on idea development with interesting insights and examples from the various professional animators interviewed. Something that would show a real passion for short story telling, how different creatives approach finding inspiration and how they develop their ideas into a story for short film. What I got in Chapter 1 was a history lesson in story construction, structure, themes and character types presented in a very dry, text book like fashion that made you want to poke your eye out with a pencil, like when you had to endure this stuff back in your school days. Not surprising, I guess, since all three co-authors are teachers. I'm not saying it wasn't great information. In fact the book and accompanying DVD includes a lot of really good information and some excellent short films by both professionals and students. It's just that much of it doesn't live up to the promise of the book's title. This isn't a book about ideas. It's a book about story structure and the building blocks that make up a short, animated story. Everything is broken down and analyzed... and I'm having a tough time remembering exactly what I read because it was tedious and clinical. It's almost like, at every step of developing a story you should have thought about everything to the 'n'th degree at every step and be able to explain the 'why' of everything present in your story. Why is that character in the story? Why did that character do or say that? Why did you choose that location? Why did that happen and not this? The book seems to forget the most important part of story telling is to just get your ideas down first. Get it all out on the page, into your word processor, script writing software etc. It feels like that's the chapter that is missing. At the heart of story telling, even stories for short films, is the fun of telling a story. All of the other stuff this book covers is information that will help you in telling a story - especially when it comes to revising subsequent drafts but a lot of it is not anything you want to think about at the idea stage. If you did you'd squash many potential ideas before they got off the ground and the rest would get lost under a huge magnifying glass of over analysis. What might have saved this book for me is the interviews with various professional artists and other industry experts at the end of each chapter. Unfortunately the questions asked weren't really what I wanted to know - or I was just so thankful to have finished another chapter I struggled to absorb anything I read in the interviews. Even worse, the industry interviews on the DVD ask the same set of generic questions to seven different professionals that is non-specific to their own work. Making them tedious to read (yes read - not video interviews or even audio only - read. Could have just put them in the book). The DVD does contain a video series of acting examples presented by co author, Kate Alexander (which she covers in more detail the book). These lessons are useful to some degree in creating more realistic emotions for your characters. Though when you look at a lot of comedy, animated shorts they rely heavily on cliche and over the top emotion simply because there isn't the time to be more realistic. Possibly the best part of the book and DVD is the Student animations. There are 16 of these and most include behind the scenes sketches, storyboards, modelling and animatics. According to the Preface this book is intended for beginners, covers the basics and is meant to be easy to read (it's definitely not easy to read). If you are completely new to story telling for short, animated films then it is a fairly solid grounding in everything you need to know. It may even prove useful to more intermediate level short film makers looking for more direction in story analysis. For me, the title is misleading and doesn't really explore ideas at all. It's more focused on considerations derived from common story structures, theory, themes and other building blocks than actual ideas. It's very much a text book that I imagine might be on many animation courses reading lists. After reading through it, I can't say I feel energized and enthusiastic to create short animations. I'm just glad to see the back of it. I'm shocked that you gave such a traitorous review . The information is on point ,well structured and easy to follow .. It sounds that you expected a book with a list of stories you could tell ,without having to thing of a story for you self .But this review is out dated aswell ,but any ways don't be lazy . We may have to agree to disagree because I feel the book was only on point if it was titled 'How to write short stories for animation' with a subtitle of 'A guide to story development and construction'. Very little of it discussed idea development, it was not in any way easy to follow and turned what should be a fun exercise into a very clinical and tedious task. I've read other books on writing and developing stories that present their information in such a way that they inspire you to explore ideas and possibilities and apply them to your own work. This particular book just felt like a chore to read and didn't inspire anything. I definitely wasn't looking for a list of stories to tell. Why would I buy a book like that if all I wanted to do was rip off someone else's story idea? Cheaper to just pick a story I like and write my own version.